While there are lots of great, healthy foods to find at Costco, sometimes they can be hard to find. In fact, I am often really surprised when I come across an especially healthy item. Now it's my go-to shop for certain things we eat a lot of like hemp seeds, coconut oil, veggies and other items. In my most recent trip to the store, I took note of the new healthy items and thought I'd share them with you. 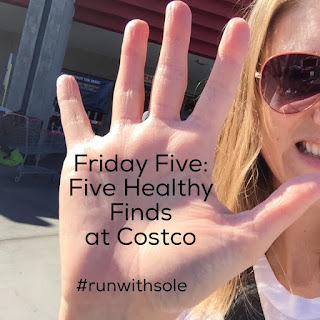 Before I continue, I'm participating in the Friday Five blog link up hosted by Courtney at Eat Pray Run DC, Cynthia at You Signed Up for What and Mar at Mar on the Run. When you're done here, be sure to check them out! 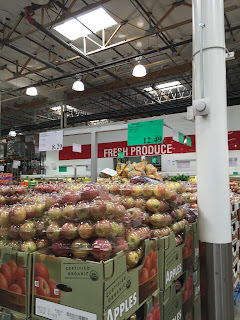 I am always amazed at the vast amount of healthy produce that's available at Costco. If your family is anything like mine, you go through fruit quickly (especially berries) and it's hard to keep up. Enter Costco. I can get organic, local fruit and vegetables in humungo size to keep up with the berry-eating fiends. And if you're looking for frozen fruits for smoothies, Costco has you covered with a lot of organic fruits, also in humngo size, in their freezer section. I stumbled upon this goodness while in the cold dairy section. I typically use almond milk as my non-dairy milk but thought I'd give this cashew milk a try. I've tried cashew milk before and liked it. It generally has more protein than almond milk, which I like. This milk is creamy and delicious. Glad my Costco carries it now! 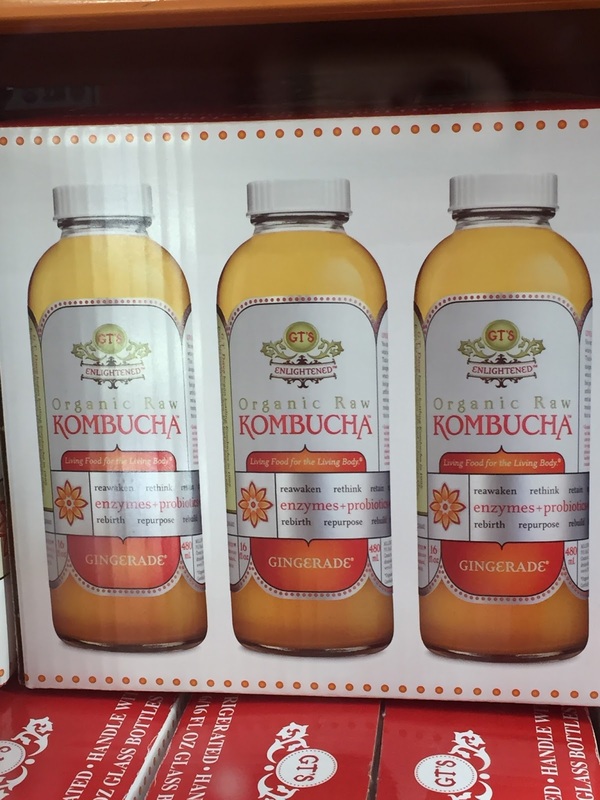 If you've never tried Kombucha, you may not want to buy it in bulk at Costco in case you don't like it. But if you have tried it and like it, here's your chance to save a little cash. This was the only flavor my Costco had, but I'm partial to the ginger flavor anyway. It reminds me of a little stronger version of ginger ale. 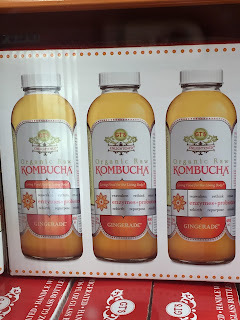 Kombucha is a great way to get some probiotics if you don't eat yogurt or other sources, which I don't. It also gives me a little kick, much in the way caffeine does, without the caffeine! I love me some NuttZo nut butters. This was the only variety at my Costco and it was still a little pricey but the jar is bigger than what you can get in the grocery store. 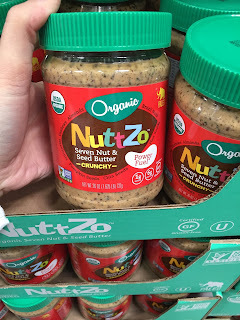 I'm happy to see Costco carrying healthier nut butter options rather than just Skippy. This isn't necessarily a new item at my Costco, but I had to include it. 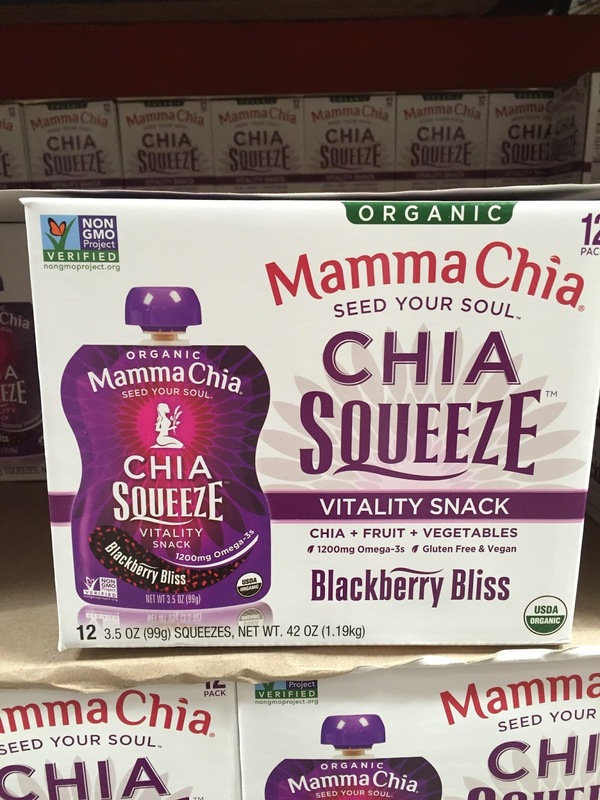 We love the Mamma Chia squeeze packs as they're a quick, easy and healthy snack for us when on the go. I also love to have one after long runs as the healthy fats help promote recovery. And I love supporting local companies and Mamma Chia is based right here in Carlsbad. What healthy items do you get at your Costco? Yes! Me too! 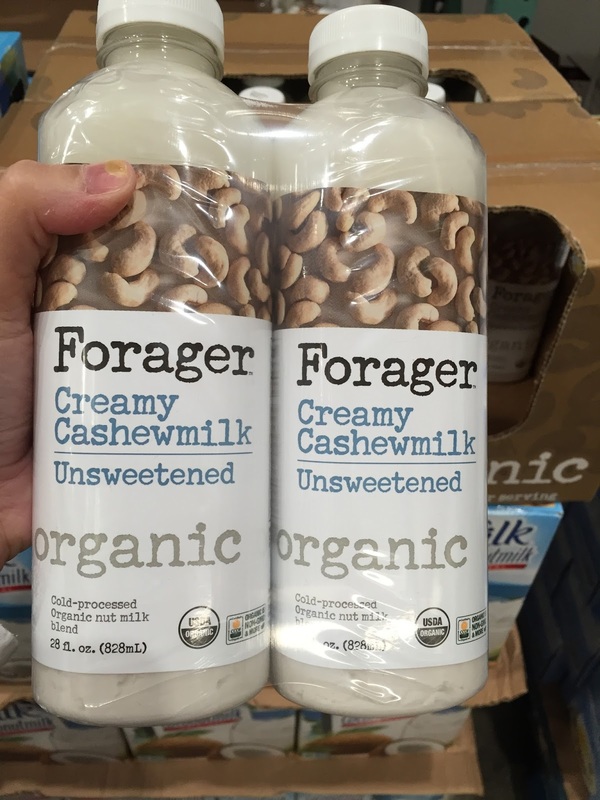 I was so excited to see the cashew milk too! Yes, I was pleasantly surprised to see the Nuttzo and Kombucha. I had to do a double-take!! Love Costco! I'm going to have to look for the cashew milk. 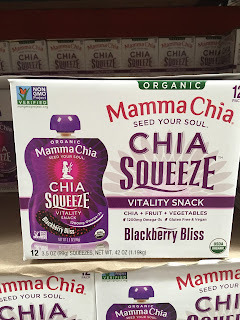 Our Costco doesn't carry the Mamma Chia anymore unless it's come back. Love getting their organic produce! I love the produce at Costco, especially the large containers of spinach and various fruits for smoothies. They also have wonderful containers of cashews and regular peanuts that we always have on hand! I know!! It's really a smoothie-lovers paradise! I wish I had a Costco membership! These are some great healthy finds that I'd love to pick up, especially that cashew milk - sounds tasty! I didn't have a membership until maybe 3 years ago. I didn't think it was worth it, but it totally is!! Especially when entertaining. We do not have a Costco near us but I assume Sams club is similar? We have a membership but don't shop there often. We should though. I have never heard of Kombucha. I should check that out! Yes, it's similar to Sam's Club, though I've never shopped there. It's the same type of store, though. Definitely check out Kombucha. It's a great way to help with digestive issues, as well as other inflammatory problems such as acne, eczema, etc. I don't have a Costco membership and actually haven't heard of a lot of these but nice they have healthy options! It's great to get healthy stuff in bulk!! It totally helps to save money! Agreed! I love how many organic options they have also, including cheese, fruit, and meat!! It makes me so happy knowing I can run in there and grab mostly what I need to cook healthy, wholesome meals for my family of 5. They even have all of my organic baking items:). Sometimes I wonder how I would live without Costco. Obviously I know I could and probably spend less money :) ,but it's just convenient when you are buying and cooking for your family. Happy Friday!! This is awesome! I even love your Friday 5 graphic. I love everything about this post including the store and the author! This was the only flavor I saw and it was in the cold section near the orange juice, yogurt and butter. Hope they have it for you! I love the organic selection at Costco! When I first started shopping there I rarely went because it was a huge pack or box of name-your-brand unhealthy snack. But now I can get organic everything for my kids, plus organic everything for me! So pleased with the direction they've moved. I know! It's been great and more and more healthy stuff is there every time I go! Looks like I need to head back to Costco. I've never been a fan. But I may need to give it another look! I would definitely give it another try!! I love Costco so much. Their produce is almost always on point, and if it's not they replace it. I buy those big bags of chocolate covered blueberries and eat a few when I get a sweet tooth after dinner. It's just enough to satisfy without going crazy. I've been on the fence about the kombucha but maybe I'll give it a try. I think the Kombucha is definitely worth trying. I would try one of the flavored varieties as they tend to be better tasting.